November 16, 2018 — Thanksgiving is the quintessential American holiday – one that celebrates American traditions, family togetherness and gratitude for the unparalleled bounty of our great nation. As families across the country prepare for their Thanksgiving feasts, American Humane went to Capitol Hill with farmers and leaders in the food industry who have committed to humane practices to take part in a Congressional briefing on “The Humane Table.” Hosted by the Congressional Humane Bond Caucus, the briefing outlined advances in humane agriculture, called on the American public to support humane farming practices, and celebrated the farmers and ranchers who work to feed the world and raise their animals right. 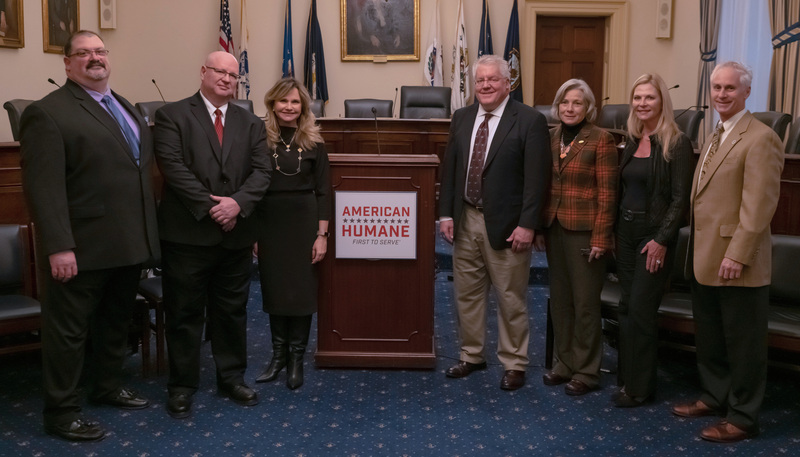 At the briefing, congressional leaders, top figures in farm animal welfare, individual farmers, and leaders of major organizations in food production outlined the importance of demonstrably humane agriculture. American Humane research shows overwhelming popular support for the humane treatment of farm animals and humanely raised foods. Its last poll of 5,900 Americans revealed that more than nine in ten (94.9%) said they were “very concerned” about farm animal welfare. More than three-quarters (75.7%) stated that they were very willing to pay more for humanely raised eggs, meat, and dairy products. And in a ranking of the importance of food labels, “humanely raised” scored highest over other labels including “antibiotic-free,” “organic,” and “natural.” Impediments to people’s choosing humane products was also explored: While one-third of those surveyed (35.3%) said they did purchase humanely raised foods, more than half (54.6%) said they were either not available (35.6%) or too expensive (19%). Nearly one in ten (9%) said they did not know the difference. Speakers at the briefing stressed the importance of verifiably humane agriculture. “As the holidays approach us, it is important that we celebrate our farmers and ranchers who strengthen the bond between humans and animals and work tirelessly to put food on our tables in a safe, ethical and humanely raised manner,” said Congressman Henry Cuellar (D-TX), co-founder of the Congressional Humane Bond Caucus. Dr. Alice Johnson, Senior Vice President for Animal Well-Being at Butterball LLC, the iconic turkey brand that has been an American Humane Certified producer since 2013 underscored the importance of humane farming using verifiable standards and practices. Bart Vittori, Vice President and General Manager of Coleman Natural Foods spoke with great fervor about the value humane farming has for his organization. American Humane was founded around the issue of farm animal welfare in 1877 and has been at the forefront of improvements and protections for children, pets and farm animals for 141 years (see historic timeline). With a history of working positively and collaboratively with farmers, ranchers, animal advocates and the American public to create moderate, mainstream and commonsense solutions that work for both animals and people, in 2000 American Humane created the nation’s first third-party farm animal welfare certification and auditing program with more than 200 science-based standards covering everything from adequate space to air quality, heat and lighting, humane treatment, and the ability for animals to be animals and express the natural behaviors of their kind. These standards for the resulting American Humane Certified™ program were built upon the internationally accepted values of the Five Freedoms, created by the Royal Society for the Prevention of Cruelty to Animals, as well as input from animal science experts, veterinarians and other animal husbandry specialists. These evidence-based standards are reviewed regularly by a Scientific Advisory Committee made up of some of the world’s leading experts and animal advocates. Today the American Humane Certified program is the nation’s largest third-party farm animal welfare certification program. More information about the American Humane Certified program can be found at www.AmericanHumane.org. American Humane was founded in 1877 around the issue of farm animal welfare, and created the American Humane Certified™ program, the first and largest independent, third-party humane farm animal welfare certification and audit program. The 200 species-specific, science-based standards of the American Humane Certified program cover everything from adequate space to air quality, heat and lighting, humane treatment, and the ability of animals to express natural behaviors, and were built on the internationally accepted values of the Five Freedoms, created by the Royal Society for the Prevention of Cruelty to Animals, as well as input from animal science experts, veterinarians and other animal husbandry specialists. The program’s standards are reviewed regularly by a Scientific Advisory Committee made up of some of the world’s leading experts and animal advocates. For 141 years, American Humane has worked positively and collaboratively with farmers, ranchers, animal advocates, and the American public as a moderate, mainstream voice to create solutions that work for animals and people. For more information, please visit American Humane at www.americanhumane.org.